Henry Tudor landing in Wales. After defeating Warwick and regaining the throne Edward began rebuilding the royal fleet by constructing ships and gathering a new cadre of experienced ship's masters. 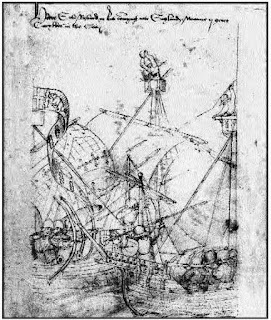 In the 1460s, he had built the first English royal caravel, the Edward, and, after 1471, he constructed fleets to support his invasions of France (1475) and SCOTLAND (early 1480s). 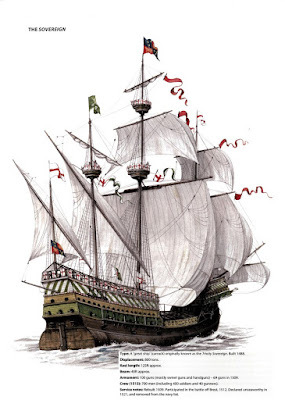 Although still meant to carry land troops to fight battles at sea, caravels were smaller, faster vessels than Henry V's high, bulky carracks, and they foreshadowed the quick, agile vessels with which Elizabethan England later defied the might of Spain. Despite these achievements, Edward still desired a small, inexpensive navy, and he maintained his fleet largely to protect trade and intercept invaders, a task that RICHARD III's flotilla of watching vessels failed to accomplish in August 1485 when Henry Tudor, earl of Richmond, set sail for WALES. After defeating and killing Richard at the Battle of BOSWORTH FIELD, Richmond, now HENRY VII, continued the naval policy of Edward IV, building new ships and establishing a naval base at Southampton. However, he still indented for vessels when he took an army to defend BRITTANY in 1492, and he, like his predecessor, lacked the naval strength to intercept the invasion forces of such Yorkist pretenders as Lambert SIMNEL and Perkin WARBECK, who both had to be defeated in land battles after their arrival in England. The small navy that Henry VIII inherited from his father had only two sizeable ships, the carracks Regent and Sovereign. Naval matters were able to open the royal purse. 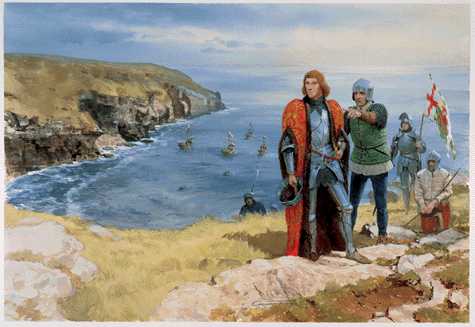 Henry VII began the build up at sea that would characterise the Tudor time. At a cost of £14.000 he let build the Great Harry, England's first warship in the sense that it was the first ship to be built solely for the purpose of fighting at sea. Great Harry was followed by more ships and Henry VII had soon created a respectable navy, earning him the name "the Grandfather of the Royal Navy". Henry's days also saw the first English explorers. Henry turned down an offer from Christopher Columbus's brother Bartholomeus to finance a journey westwards. Later John Cabot won the Kings ear and explored Newfoundland, thus becoming the first European to set his foot on the American mainland. By late summer 1483, Richard III's usurpation of the English Crown and the growing belief that he had murdered his nephews made Richmond a more attractive candidate for the throne (see USURPATION OF 1483). While Richmond's mother plotted with Queen Elizabeth WOODVILLE to put the earl on the throne and marry him to ELIZABETH OF YORK, daughter of Edward IV, Henry STAFFORD, duke of Buckingham, deserted Richard and hatched his own plot. In the autumn, the two conspiracies merged into BUCKINGHAM'S REBELLION, an unsuccessful uprising that Richmond himself supported with an abortive descent on the English coast. Although Richard's soldiers tried to draw the earl ashore by posing as friends, Richmond learned of Buckingham's failure and returned safely to Brittany. In 1484, as a growing body of English exiles collected around him, Richmond fled into France, foiling a plot by Pierre Landais to turn him over to Richard's agents. With French assistance, Richmond and his uncle landed in Wales in August 1485. Leading a force of over 2,000 French and Scottish mercenaries and some 600 English supporters, Richmond crossed Wales and entered England, collecting support along the way from both old Lancastrians and disaffected Yorkists. However, his army was still smaller than the king's when he met Richard in battle near the village of Market Bosworth on 22 August. Defeated by disloyalty in his ranks and by the intervention on Richmond's side of Sir William STANLEY, brother of Thomas STANLEY, Lord Stanley (Richmond's stepfather), Richard was killed on the field, and Richmond was proclaimed king as Henry VII. As heir of Lancaster, Henry sought to symbolically end the WARS OF THE ROSES by marrying Elizabeth, the heiress of York, in January 1486. Nonetheless, Henry spent much of his reign combating Yorkist attempts to regain the throne. In June 1487, he defeated the partisans of Lambert SIMNEL at the Battle of STOKE. Simnel claimed to be Edward PLANTAGENET, earl of Warwick, the nephew of Edward IV and the last Yorkist claimant in the direct male line. A prisoner in the TOWER OF LONDON since 1485, Warwick was executed in 1499 after being implicated in an escape plot with Perkin WARBECK, another Yorkist pretender who had troubled Henry throughout the 1490s by claiming to be Richard PLANTAGENET, duke of York, the younger son of Edward IV, who had probably died in the Tower with his brother EDWARD V in 1483. Despite these and other Yorkist threats to his dynasty, Henry VII, at his death on 21 April 1509, peacefully passed a stable and strengthened Crown to his son Henry VIII.